Australian Defence ForceBrig. Gen. Abdul Raziq, Kandahar chief of police, speaks to the assembled locals of Kajran in Daykundi province during a shura Oct. 22. The Taliban carried out an insider attack on Thursday inside the governor’s palace in Kandahar province, killing the provincial intelligence chief, wounding two Americans and barely missing the top US commander in Afghanistan, General Austin “Scott” Miller. But the attack also killed Brig. 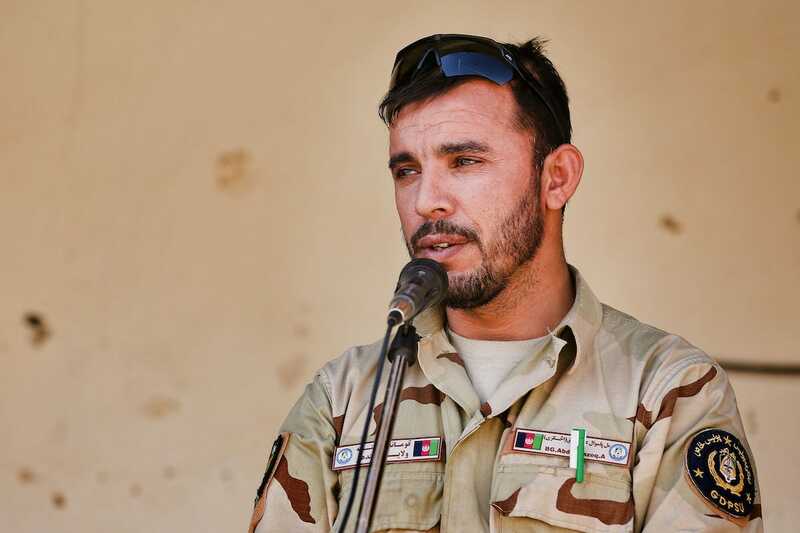 Gen. Abdul Raziq, Kandahar’s powerful police chief. But he was also a fierce critic of Afghan President Ashraf Ghani, and had been previously accused of torture and corruption. Here’s a look at his life and impact. Brig. 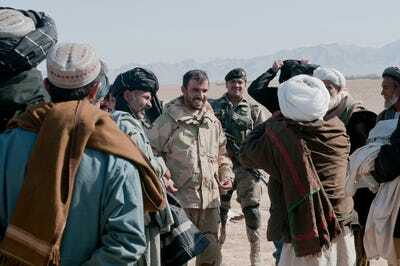 Gen. Abdul Raziq was an ethnic Pashtun who was born in southern Kandahar province’s Spin Boldak district. 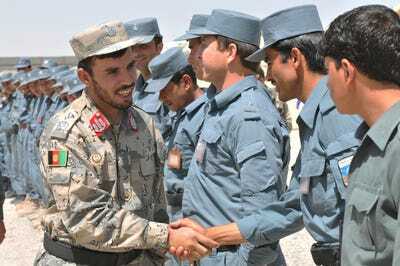 DVIDSRaziq, left, shakes hands with Afghan Uniform Police instructors at the Kandahar Regional Training Center in southern Afghanistan, on June 7, 2012. Raziq’s friends said he picked up a gun for the first time when he was 17 years old, according to The New York Times, and he repeatedly bragged about killing Taliban fighters. In 1994, the Taliban killed his dad and uncle, the latter of whom was a fierce Taliban fighter himself, before Raziq fled with his family to Pakistan. 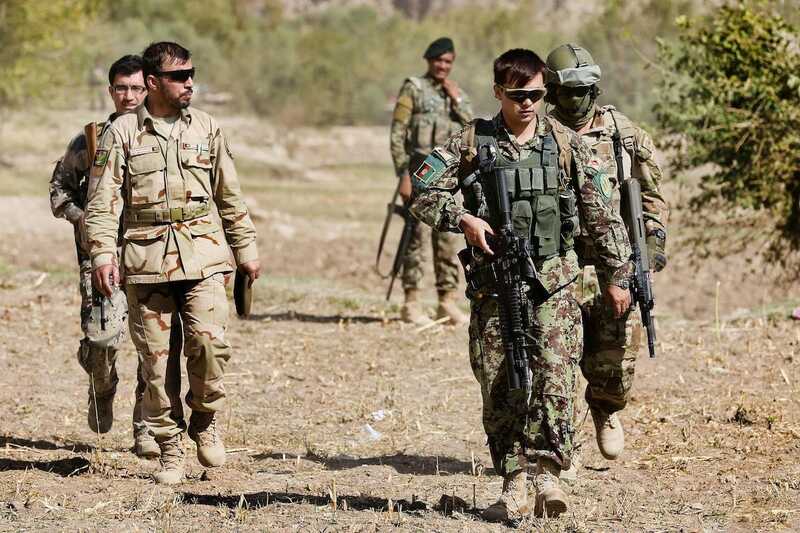 In 2001, after the US-led invasion ousted the Taliban, he returned and began fighting against the Taliban, eventually overthrowing them in the area. Soon afterwards, Raziq became a police officer, operating along the border between Kandahar and Pakistan’s Balochistan province. 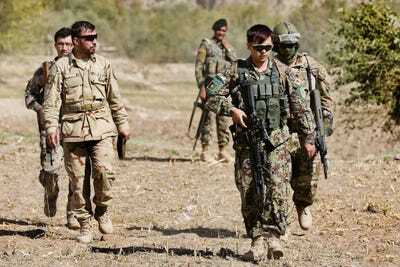 He would quickly rise through the ranks, becoming a trusted ally of the US as he was seen as a fierce Taliban fighter. US ArmyRaziq talks with district elders following a key leader engagement to discuss security and development projects in Ghorak district in Kandahar province in January 2013. 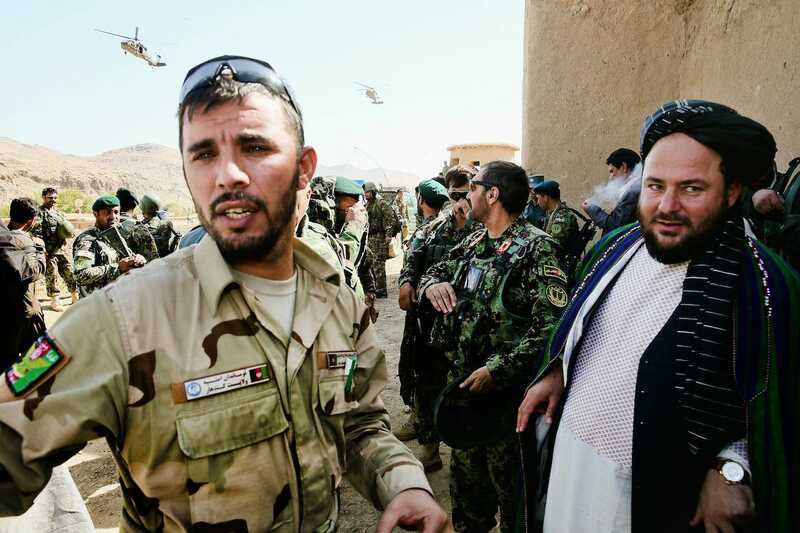 In 2011, after the Taliban assassinated Khan Mahammad Mojayed, the former Kandahar police chief, Raziq was made the provincial police chief, charged with securing Kandahar City from the Taliban. Australian Defence ForceBrig. 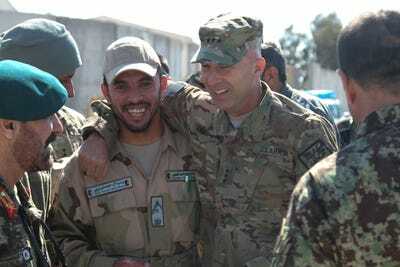 Gen. Abdul Raziq, Kandahar chief of police, and Amir Mohammad Akhundzada, provincial governor of Uruzgan, during their visit to Kajran in Daykundi province on Oct. 22, 2013. By 2015, with a group of loyal police officers, Raziq had taken control of Kandahar province using scorched-earth methods, and earning the praise of US military leaders. US ArmyLt. Gen. Joseph Anderson, commander of International Security Assistance Force Joint Command, greets Raziq at Joint Regional Afghan National Police Center on Feb. 11, 2014. And with his increasing power over the years, came increasing wealth. He owned businesses in other countries, dealt in horse trading and spent a lot of time in Dubai. But Raziq would also be accused of human rights abuses, corruption and drug-trafficking along the way. Australian Defence ForceBrig. Gen. Abdul Raziq, Kandahar chief of police, (center) arrives at Kajran in Daykundi province for a shura Oct. 22, 2013. In 2017, the United Nation’s Committee against Torture said it was concerned about allegations that Raziq was complicit, if not personally implicated, in torturing detainees thought to be associated with the Taliban, including using such methods as, suffocation, crushing testicles, pumping water into stomachs, electric shock treatment, and numerous disappearances. Raziq repeatedly denied those allegations. 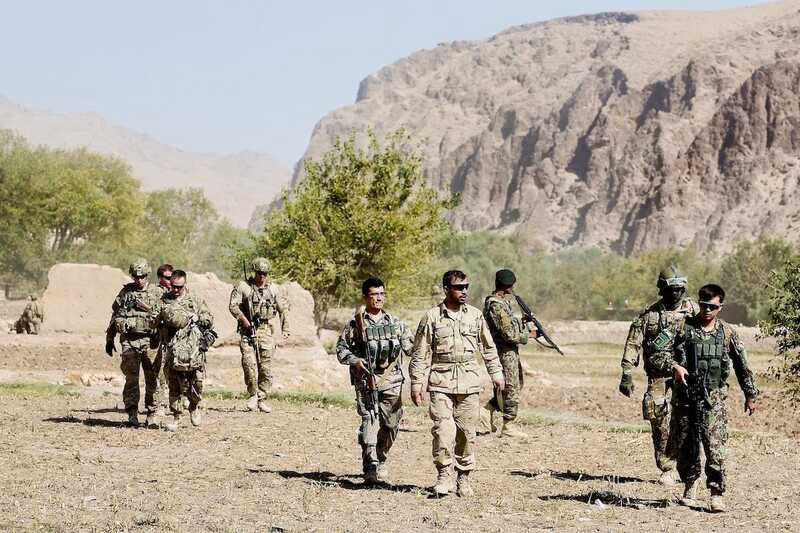 To the Taliban, Raziq was a sought after target. In fact, the police chief had survived several assassination attempts over the years, once telling TOLO News he had escaped 29 attempts. US ArmyBrig. Gen. Abdul Raziq, Kandahar chief of police (left), arrives at Kajran in Daykundi province for a shura Oct. 22, 2013. 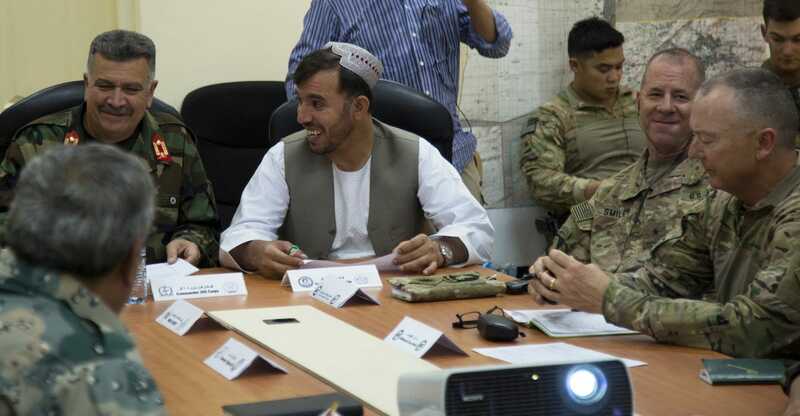 In the last few years of his life, Raziq often disregarded the chain of command, criticised Afghan President Ghani and would walk around without his uniform on. Ghani considered firing him, but the US dissuaded him, arguing it would bring instability. US ArmyUS Army Brig. Gen. Jeffrey Smiley sits down with Brig. Gen. Rahman Parwani and Lt. Gen. Abdul Raziq to discuss the operational needs of the province in Kandahar, Afghanistan, on July 3, 2018. Raziq was shot four times and killed on Thursday when a Taliban gunman opened fire on Raziq and other officials as they were taking pictures outside the Kandahar governor’s palace yard,according to TOLO News.